April 11, 2019 -- Fifth grade teacher Kristi Glasier is big on traditions. 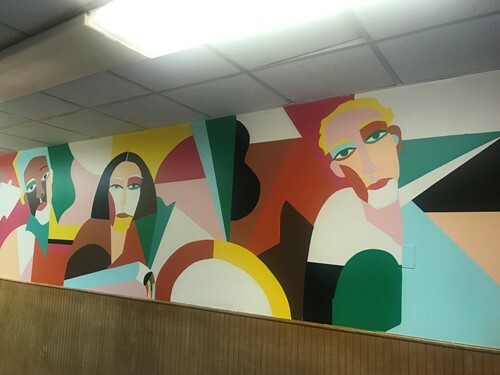 “I think it’s important to establish traditions and ceremony that students look forward to over the years,” she said of the mural she recently commissioned for the building. The painting, located in a hallway that nearly every student passes through each day, will be dedicated to the 5th grade class of 2019, and will be the first in an annual tradition. She reached out to Roxboro Elementary parent and visual artist Lauren McKenzie, the first woman of color to have a mural displayed at Cleveland’s Public Square. McKenzie jumped on board and the mural was painted at Fairfax in late March. When the students saw the finished product, they were stunned. “She did that for us? !” they said. Ms. Glasier is planning a dedication ceremony and reception for later this spring when a plaque will be revealed containing the name of every 5th grade student. The mural was funded by Ms. Glasier’s husband’s 5th grade teacher, who now lives in Florida and has a habit of funding various school projects around the country that inspire her. She and Ms. Mckenzie will attend the reception along with students and their families. “It’ll be so special,” one student exclaimed when Ms. Glasier described the event. “That’s the point!” was her teacher’s response.